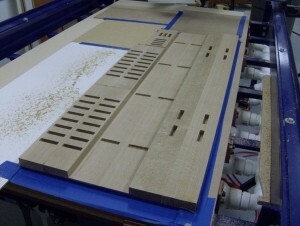 I’ve been working on another dining table, this one a “Prairie Style” table for a client out of quartersawn white oak. 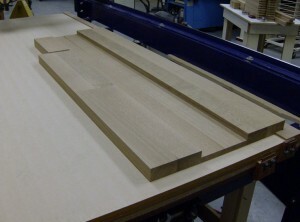 The design includes a bunch of mortise and tenon joints, which of course I decided to cut on the ShopBot (is there another way?). A dilemma stemmed from my lack of either a tool changer or second Z axis, and the desire to use two bits to create the mortises – a 1/4″ down-spiral for the bulk stock removal, and a 3/16″ down-spiral for the final clean up, mainly to get a tighter radius in the corners. So I was faced with the prospect of either multiple bit changes (2 for each of the 8 parts, plus test cuts), or placing each workpiece back on the table one at a time for the final cuts after doing all the roughing cuts with the first bit. 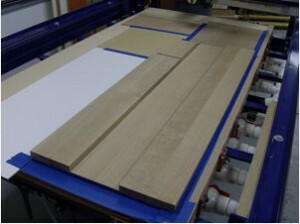 Both options presented disadvantages – the first would wear out my hands and patience, the 2nd would require exact re-positioning of each part on the table for the second operation, and a tedious process of masking and taping the perimeter of each part to ensure solid vacuum hold-down. 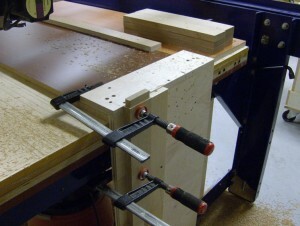 So I came up with a third option, which involved placing all the parts together on the table, then using each bit to machine all the mortises at one time. Whether you ever want to do this or not is up to you, but the pics will also show my technique for holding solid wood parts of various sizes using only my basic vacuum setup, and no dedicated one-time-use fixtures. 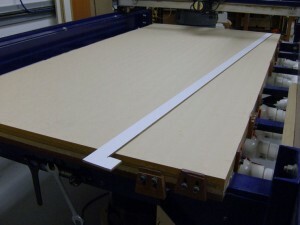 I started with a smoothly surfaced spoilboard, and a simple “L” shaped fence of 1/4″ MDF cabinet back material. Made from scraps left over from cabinet part cutting, it has a non-porous white material on one face, making it perfect for masking uncovered areas of the spoilboard. 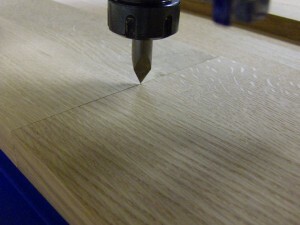 It’s inexpensive, expendable, cuts easily (won’t damage bits) and creates a complete seal of the spoilboard surface when placed with the white face down. The “L” shaped fence is something I use often to position parts away from the edge of my table where vacuum is the weakest, and to span the space between my wooden stops to make it easier to position small parts. 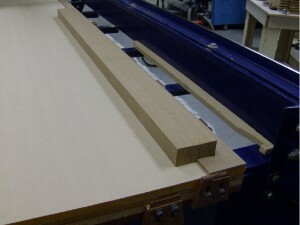 I then tightly stacked the parts to be cut. Accurately machined surfaces allowed the parts to fit snugly to one another, minimizing any vacuum leakage between the workpieces. 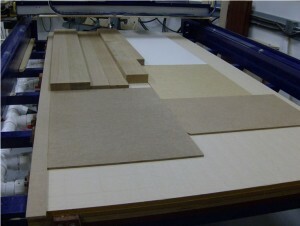 After closing off unused zones, I covered the remaining open areas of the spoilboard with more scraps of the 1/4″ MDF material. Taping all the seams and edges with blue masking tape provided a nearly zero-loss vacuum setup, verified by the vacuum gauge showing nearly full vacuum (about 5″ HG with my two Fein vacs) and pushing/pulling on the parts just to be sure. The setup was rock-solid and only took about ten minutes to create. Now for the real work. I used the tip of a V-bit to record accurate locations for the corners of each set of parts, and drew the parts in those locations in PartWorks. Since the parts varied in thickness, I created separate files for each group of parts and just re-zeroed the Z axis to the top of each group before running it’s file. One file for each bit, for three sets of parts created 6 files. I could have combined the files or created a master file to automate the process, but for a one-time set up it was faster to just run each file manually after re-zeroing the bit. I made some test cuts in a scrap piece of the same material before committing. 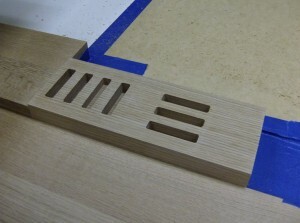 The end result was accurately machined parts, only two bit changes, and a quick setup that used up only some masking tape.And, in case you were wondering, here’s how I made the matching tenons.